Over the past four years my family has been transitioning from commercial products full of harmful chemicals to all natural products. In the small chance we can’t find a product, we make our own (which can be messy with two boys.) The one thing we couldn’t make or get right was deodorant. Now, if you’ve ever tried natural deodorants, you understand the ups and downs that come with it. You find a brand, it seems to have everything you want, doesn’t smell like aluminum, so you buy it. You get excited, wear it and after a 20 minute walk, you find yourself at a Walgreens purchasing wet wipes, a trial size of Secret and a resolve to never try it again! This has been my struggle for way too long, until now. I can admit I was skeptical and that I waited a full day before trying the deodorant but once I did, I was all in! Zak‘s simple philosophy on what a natural deodorant should do only confirmed what I felt once I started using Elevate. non-toxic, natural body care products, and to help you discover your natural well being. We have replaced irritating, toxic chemicals found in conventional deodorant with natural, plant-based ingredients. Our innovative deodorant formulas bridge the gap between natural health and deodorizing effectiveness. 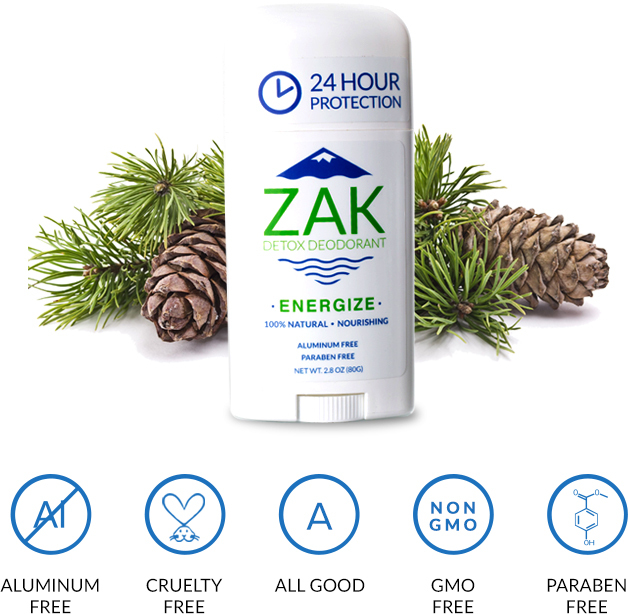 Zak Detox Deodorant is packed with antioxidants, vitamins, minerals, and fatty acids that repair and replenish your cells. It is made to respect your health, your expectations, and our environment. Now for the good stuff! The awesome team at Zak has provided me with a full size product and two minis (for those on the go moments) for one lucky reader! As well as discount code to share with all my readers! Can’t wait until Monday when we announce the winner? Head over to Zakbody.com and score yourself a summer must have! This review was right on time. I overheard somw people at the gym over the weekend talking about natural deodorant. I don’t know what kind she used but it wasn’t working. She was discussing it with the front desk and asked if they had some to sell. I believe she ended up going to the Kmart that’s a few doors down. I’d like to try it. I have been looking for a new natural deodorant! I’m not totally in love with the one I have now. Thanks for the scoop! I have never tried natural deodorant but am open to giving it a try.